A look at the technology needed to add printers to an IoT office ecosystem, as well as cost and security implications. As enterprises incorporate connected technologies into the workplace to create an Internet of Things (IoT) ecosystem, it’s important to remember the ubiquitous office staple that bridges the digital and physical worlds by way of a simple sheet of paper: the printer. Linking the printer to a network of smart devices that can communicate and share data with each other in an “Enterprise of Things” will provide an abundance of new functionalities and services, enhancing employees’ productivity and efficiency. Users could be guided to the closest available printer or copier from their mobile device, even if it was not on the same Wi-Fi network. Users could view on their mobile device the print capabilities of the device before connecting (colour/mono, page sizes supported, duplex support, etc.). Users could be automatically authenticated when printing/scanning without a PIN or badge, with the mobile device acting as the authenticator. This creates security for sensitive documents; the automatic authentication assures a user that their job will print only when they are in close proximity, so they can immediately retrieve the print job. IT technicians also can benefit from printers on an IoT network. IT has access to the location and the status of all printers he/she services – useful for enterprises in which one IT person may be servicing dozens of printers. IT has assurance that sensitive information is not being left at the printer for anyone to see since the user must be near the printer for the print job to start. Not to be forgotten is the real-time data that a smart printer will generate, which can be analysed to help businesses lower overhead, optimise workflows and create efficiencies. For example, data can be analysed to reveal usage patterns, and machines can be put to sleep or powered off automatically or remotely, lowering energy costs and reducing an enterprise’s environmental footprint. For an enterprise to support these new efficiencies requires incorporating a capability called proximity-based pairing. A new capability provided by printers on an IoT network is “proximity-based pairing.” Using Bluetooth Low Energy (BLE) beacon technology, an employee could view their location – i.e., their mobile device’s location – relative to nearby printers, and actually be guided to the printer they choose to print to or scan from. Proximity-based authentication, using BLE beacon technology, also can be used to limit printer access to only when the employee is in very close range to the printer. As with many new infrastructure technologies, a minimum level of deployment is needed to make the technology useful. In this case, offices must have BLE mesh networks – a network that uses wireless mesh nodes based on BLE. An IoT mesh network might include tens of thousands of nodes, all of which can speak to and communicate with each other, and printers would join the mesh as additional nodes. This broadens the view of the printers; even if a printer is out of range, other devices in the mesh network “speak to” each other, creating a relay from device to device. This means, in a true IoT environment, a printer might “talk to” a smart light bulb, which talks to a smart thermostat, which talks to an employee’s mobile device – all within microseconds, creating a seamless, nearly instantaneous connection between mobile device and printer. Even if the two are out of range of each other, as long as other nodes on the network are in range, connectivity is maintained. Right now, not many buildings have this type of network, but if a business bought three or four BLE-enabled printers, those printers could create a mini mesh network of their own. Employees within range would be able to see the locations and capabilities of each and choose which to use. This network would still provide proximity-based pairing and authentication. Over the longer term, as mesh networks are more widely deployed, the printers seen by the user could extend over a greater distance, across a collection of different BLE node types, including connected light bulbs, wall switches, thermostats and other types. While adding printers to an IoT enterprise environment will enable efficiencies, it can also create threats by making them “highly vulnerable, powerful attack vectors,” but BLE can help negate these threats. While an IoT networked printer can advertise its location and capabilities to mobile devices within range of a mesh network, the BLE beacon technology can be used to limit actual pairing and data communication to a very short distance; thus, the user would be required to have direct physical access to the printer (in other words, someone standing on the street would not be able to connect to the printer inside the building). The IoT technology does not enable greater access via a larger data network. Therefore, the security risk of adding BLE beacon technology is relatively small. On the other hand, the security benefit of enabling a user to be in very close proximity to the printer before he/she has access to send data, i.e., the print job, to the printer, adds an additional level of security to prevent unauthorised access to the printer, and thus the enterprise’s network. While the vast majority of printers today already include Wi-Fi connectivity, very few printer models support BLE. From a printer manufacturer point of view, there is the additional hardware cost of adding BLE connectivity. Multiple communication chip companies offer BLE/Wi-Fi combination chips, and so the direct cost of adding this IoT printing capability to printers that already include Wi-Fi is relatively small – it’s just a matter of switching out that communication chip. There is also the development cost of the software components to consider, including the need to track developing industry standards and the possible need to support multiple protocols. 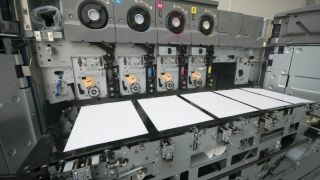 This additional cost creates the opportunity of increased printing, enabled by the new mobile printing functionality. From an enterprise point of view, while upgraded printers may be slightly more expensive than current non-smart versions, the benefit will be ease of printing in remote locations by mobile users, and thus a more productive and efficient workforce. The fundamental technologies to support printer IoT solutions are all available today. However, one key task is to define a BLE beacon profile for printers and scanners, and have it adopted by the Bluetooth Special Interest Group (SIG) – the organisation that oversees the development of Bluetooth standards and the licensing of the Bluetooth technologies and trademarks to manufacturers – as a standard, so that printer companies can develop a common communication solution. Work is well under way by several print technology companies, operating system vendors and handset providers, all working with an industry advocacy group, to define a spec for review and adoption by Bluetooth SIG. Also required is a software SDK on the mobile device to communicate with the printer’s BLE Beacon and interface to the mobile printing app. The printer itself will require BLE beacon hardware along with the firmware components to integrate with the printer and communicate with the mobile software SDK. Ongoing integration with emerging indoor location and voice interface technologies will further enhance the user experience. While we’re not quite there yet, there’s no doubt that printers belong in an IoT ecosystem, and the efforts of manufacturers and print technology companies to make it a reality shows that the future of printing is very bright indeed.